Arles Cole is a Pearl Harbor Survivor on the USS West Virginia. 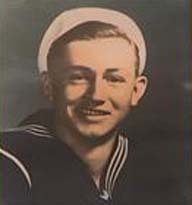 He enlisted in the Navy December 31, 1940 - just a couple of weeks after turning 17. After training and Navigational School he went aboard his first assignment, the newest battleship in the Pacific Fleet, the USS West Virginia. During the Japanese attack on December 7, 1941, his position was four decks below the main deck. It is there that he was trapped. "When the torpedoes began to hit I saw oil and water coming in down that long passage way. Just pouring in," says Cole. He escaped by squeezing through a hole to the next deck. There he picked up a wounded sailor and carried him up three ladders to the main deck. He served as a sailor for 3 years 8 months and 20 days in almost continious battle conditions.